On Monday morning, I woke up in a tent in a field in Somerset at around 03:45 and began to get up. Some people were still partying hard from the night before as we packed up the tent, gathered our stuff together and - a little before 6am - were in our cars, making our way off the site to drive back up the M5 to Nottingham. 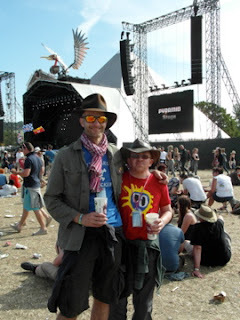 We'd arrived in the same car parks just a few short days before - arriving at around 5am on the Wednesday morning, but a mere five days later and I was knackered. You can cram a lot into five days if you really try. I've had a full day in the office today and I'm exhausted. Okay, so nobody made me go for a run when I got home... but my running club does this thing where you collect a stamp for each week where you attend at least one run. As you accumulate stamps, you get different gifts: a free t-shirt, a nutrition pack... that kind of thing. If you get up to fifty stamps within 365 days of your first run, then you win a GPS watch worth £250. My year ran out today. I had 49 stamps and needed to make it to a run on Monday if I wanted to earn my watch. I made it. I managed a quick disco nap on Monday afternoon, and I think I was mostly sweating red wine and cider as I flogged my way around the three mile course, but I made it and will get that watch. I've never been as injured as I've been this year, but I still made it to 50 weeks out of a possible 53 at Running Club. I don't know if that's heroic or just dumb, but that's what I did. I don't actually WANT the watch, but that's not really the point. That was NEVER the point. I'm sure you're sick of the saturation coverage by now, so I'm not sure you really want to hear much from me on the subject. Hell, I was there and I'm heartily tired of the coverage. I've heard songs from the Mumford and Sons set on Sunday night three times already today, and I made a point of being at the stage furthest away from the site from where they were playing. They're flipping unavoidable! So what needs to be said? That we got onto the site proper before gates were officially supposed to be opened? That we were fully pitched up and dishing out the mojitos by about 08:30? (well, it is after the shipping forecast and that's the golden rule, isn't it? NEVER drink before the shipping forecast....at 05:20. After that, it's fair game. I ummed and ahhed about it a bit, but in the end I just had to watch the Rolling Stones. They opened up their set with a 1-2-3-4 punch of Jumping Jack Flash, It's Only Rock and Roll (but I like it), Paint It Black and Gimme Shelter. It's pretty hard to argue with that, and Keef Richards looked like the coolest person on earth. Come the end of the world, and he's still going to be around, chopping out mega riffs for the cockroaches. The man is a marvel. At some point during Honky Tonk Women, I was inspired to get out my very own rooster dance and display it in all of it's strutting glory to the people in the ground around me. On Sunday night, I finished my festival with Cat Power up at the Park stage. It was fantastic: her songs are so emotional and powerful, but she's clearly intensely shy and has real difficulty so much as speaking to her audience. She's keen to communicate though, as best as she can, and she ends up waving shyly at us. It's incredibly endearing. She sounds great too.... well worth the trip up the hill... and I find myself spending half an hour or so by myself at the top of the site after she finishes, just to take the whole scene in for a while before heading to bed. 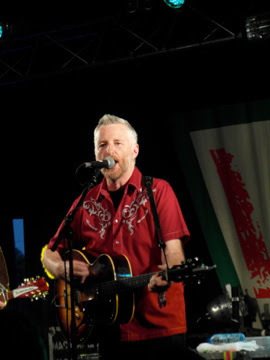 Billy Bragg was good too. I saw him on Friday night in his natural habitat of the Leftfield tent, and I saw him again on the main stage at lunchtime on Saturday and he was great both times. I was a little disappointed that the set - including ad libs - was mostly the same, but he's alright by me. I also saw him again on Sunday lunchtime, in a Q&A session with a Labour MP and an 88 year old Tony Benn. Benn is now 88 years old and has recently been in hospital, but the man is a shining example to us all and he dispensed his usual wisdom whilst puffing away on his pipe and swigging from a large mug of tea. They really don't make them like that any more, more's the pity.... here's hoping we get another chance to see him. The food was incredible, as always. My top 3 meals? Hmm. Tough one. I think the Keralan chicken curry I had up by the Park, the Jerk Chicken I had near the Leftfield, served fresh off the BBQ with rice and peas and a ginger beer... but best of all? The four cheese ploughmans I had from the Greenpeace market, served with proper chutney, bread baked on the site, some pickled onions and an actual apple. The cheese was local and it was EPIC. I actually had a conversation with the guys sitting next to me about it. 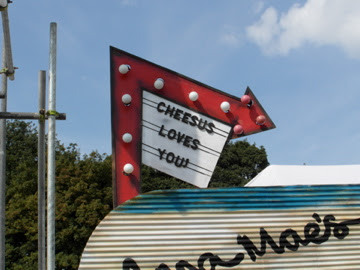 They wanted me to settle a debate about which cheese ploughmans was the best on site: this one or the one near the West Holts stage. Apparently that had only one cheese and one hunk of bread, not a selection, but was a couple of quid cheaper. I nearly got up and went straight over to West Holts to make a direct comparison. Mmm. Cheese. Yeah. So that's probably it. It was lovely. I saw lots and still barely scratched the surface of the thing. I made it to Arcadia, but never did see the Lords of Lightning. I didn't get close to the cabaret, circus or theatre tents and I didn't watch a single band on the John Peel Stage this year (giving up Everything Everything and Johnny Marr on Saturday evening for a decent position with my friends for the Rolling Stones). Maybe next year? 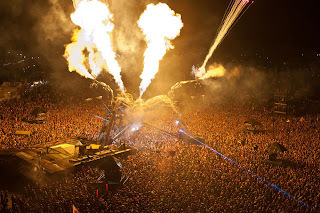 You can't see everything, and to try to do so at a festival this big is just madness. 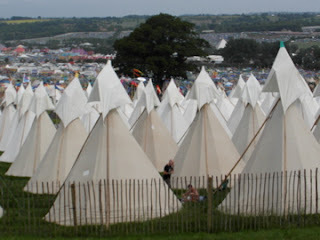 Maybe next year will also be the year that I rent a tipi..... I really quite fancy that. Looks pretty good, huh? Right at the top of the site between the Park and the Green Fields. Fewer people kicking my guy ropes, for one thing.... never underestimate the virtues of that. 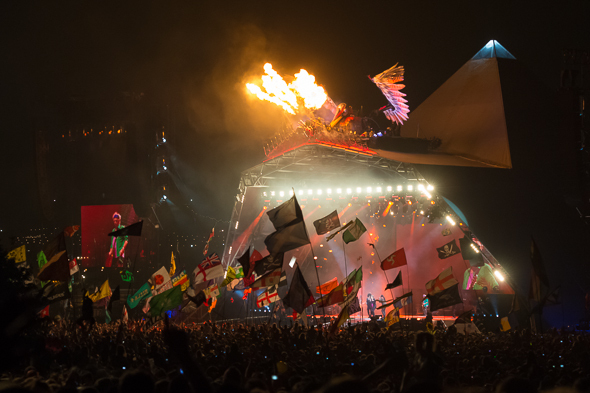 357 days to Glastonbury 2014!